The real growth of Swansea as an industrial centre is thought have commenced in 1717 on the initiative of Gabriel Powell. 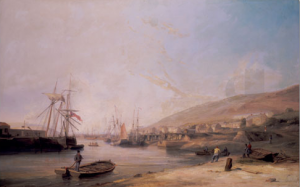 In his post as steward to the Duke of Beaufort, he advocated that the copper industry was started in Swansea pointing out its accessibility and nearness to the port in Cornwall where copper ore was obtainable, local sources of cheap and suitable coal, and the harbour for transport. The first copper works in Swansea were established in Landore in 1720 by Dr Lane and Mr Pollard, who had owned copper mines in Cornwall. That year Swansea was described as “the best built and most cleanly town in all Wales”. In ‘Swansea – A photographer’s Dream’ Colin Riddle’s pictures of Swansea in the 1960s represent images of a lost age, and though much of what he photographed still exists for the keen historian to seek out, much has also disappeared.